For an exciting vacation in the United States visit the sleepless city of Las Vegas, Nevada where time seems to stand still. Photo of the lights from the hotels on the Las Vegas Strip in Nevada in the United States where your vacation is unforgettable. ... The entertainment, hotels, shopping, restaurants and casinos are just a small portion of what Las Vegas has to offer.Evenings are exceptional in Las Vegas, Nevada and walking from hotel to hotel to see all the sights is fairly simple. 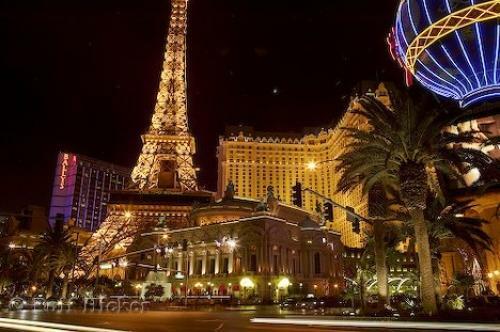 Transportation does exist such as buses, monorails and taxis but walking around Las Vegas will ensure that you will see everything on your vacation.Paris Las Vegas, Eiffel Tower, Vegas Strip, Las Vegas, Nevada, USA, North America. I photographed this photo with the digital SLR camera model Canon EOS-1DS, aperture of f/16.0, exposure time of 4/1 sec. on ISO 100, as always I used a original Canon Lens, the focus lenght for this picture was 28mm.